Thank you, Ceri, for featuring my latest book “Passages – A Pemberley Tale” on your wonderful site and at such short notice. To be honest, health issues have plagued me this year and I was not sure when, or if, I could get it done in 2016. This tale was my first attempt at writing a long story and it will always have a special place in my heart. Written and posted on a large JAFF forum during 2008 to 2009, I posted it on my own forum, DarcyandLizzy.com, last year when things were slow. For years now some of my readers have begged me to publish the story and after practically rewriting it for the forum, I decided to oblige. I worked on the story with my editor and betas again this year, hoping to get it ready to publish before 2017 and I barely made it with a few days to spare! Blurb: Years after her ruin at the hands of George Wickham, Georgiana Darcy is a virtual prisoner at Pemberley as a result of her brother’s good intentions. Drastic changes have taken their toll, leaving brother and sister adrift from polite society. Unaware of her identity, Elizabeth Bennet finds herself the recipient of Fitzwilliam Darcy’s benevolence while she recovers from her own encounter with Wickham. Elizabeth’s presence breathes life back into Pemberley and its occupants, until Wickham returns with a nefarious plan to regain control of both Elizabeth and Georgiana. Riding furiously three hundred yards behind the coach, William knew from the way it darted back and forth across the road that it was only a matter of time before it crashed. When the coach had streaked passed, giving him a glimpse of the woman he loved, his only thought was to save her. Richard would come after securing those at the house, of that he was certain. Yet he could not count on his cousin reaching him before he had to confront the occupants of the coach. What if LeStang threatened to harm Elizabeth unless he laid down his arms? This was his last thought before he realised the vehicle had begun to topple. Reining in his horse, he watched the crash unfold as though in slow motion. The driver was hurled through the air, his screams competing with the cries of the horses as they were dragged down with the equipage. Hitting the ground, the impact caused the coach to break away from the animals and slide for yards in the mud, before coming to a halt. William sat deathly still until the carriage stopped moving except for the wheels, which creaked as they made a few more revolutions. Pulling his pistol from his waistband, William nudged his mount in the direction of the wreck. He passed the driver lying dead on the side of the road, the victim of a broken neck. As he rode past the horses, it was evident that they were all either dead or dying. Detecting no movement from inside the coach, by the time he pulled his stallion to a stop, he was holding his breath. Suddenly, the door of the coach, which was now situated on top, began to open slowly. Catching site of a decidedly feminine hand, his heart began to beat wildly. Elizabeth! Erelong she was standing in the opening—sleeves torn, hair dishevelled and eyes wide with fear. Before he could rejoice, LeStang rose to stand beside her and pointed a pistol in his direction. Though enraged, William struggled to stay calm. Hoping Elizabeth might draw strength from him, William showed no fear as he dismounted and walked deliberately towards the coach, pistol in hand. Reaching the vehicle, he flipped the weapon, presenting the handle to LeStang, who took it and pushed it inside the waist of his breeches. “Not here,” came her whispered reply. With a quick nod of acknowledgement, he situated her on the edge of the coach and jumped to the ground. Then he reached up to help her slide slowly down into his arms, taking the opportunity to murmur quietly two more words: Push him. William looked earnestly at Elizabeth and squeezed her hands before backing in the direction LeStang had indicated. The villain proceeded to pull himself atop the coach and quickly jumped to the ground, pointing the pistol at William once he had his footing. Then grabbing Elizabeth’s recently healed arm, he jerked her to his side. His actions caused her to cry out in pain, and eyes ablaze, William took a step towards him. LeStang laughed, raising the pistol higher. If he was surprised at the presumption, William did not show it. Instead, he lifted his chin as if acknowledging the claim. Elizabeth coloured as their eyes met, yet she could not look away. William’s lips tightened in a fine line. LeStang laughed menacingly and, stretching out his arm for better control, aimed at his rival. Suddenly understanding what William had meant, Elizabeth gathered all her strength and shoved LeStang just as the pistol fired. LeStang stumbled, and the bullet missed its mark, though it still lodged in William’s shoulder. Meantime, Elizabeth’s feat had given William enough time to grab the pistol he kept in an inside pocket of his coat. EEeeeeep! Goodness, how exciting! Thank you for the excerpt, Brenda. If you need to read this book instantly it's available to buy now on Amazon. Here are the Amazon US / Amazon UK links, but it's available on other Amazon sites too. 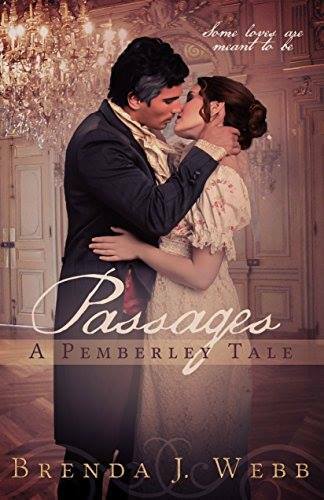 Brenda J Webb is offering a giveaway to commenters on this post: there are TWO signed paperbacks of 'Passages - A Pemberley Tale' which can be won by US/Canada-based commenters, and 2 kindle copies of the story available for international entrants. To enter, just leave a comment on this post by the end of the day on Wednesday 11 January 2017. Please ensure that you leave a way for me to contact you in case you are the winner, and please state whether you are US/Can or INT. The first US/Can winners selected will be offered the signed paperbacks. Thank you so much to Brenda for the generous giveaway! Wow, a highwayman? Something worse? Who is this LeStinky character? Oh, I must read this, I love a courageous Darcy and a feisty Elizabeth! If it's a typical Brenda Webb story, I know I will love it. Hi Nicole. This seems like such an exciting read! Wow.....And this is Chapter 20??? ......I can't wait to read how it all began. Thank you for a little love in the morning. This sounds fantastic! Thanks for the giveaway, and congrats to Brenda on the new release! And I'm in the U.S. Thank you for another great novel filled with suspense, excitement, and romance. All your novels are intriguing. Thank you also for the great giveaway! Hi MaryAnn. Brenda's novels are always exciting. Thanks for commenting and good luck in the giveaway. Yowsa, sounds very exciting! Thanks for a chance to win a copy! I'm in the US. It does, doesn't it Pam! Good luck in the giveaway. Oh my. I am so glad you published this! I have the ebook in my TBR pile. It looks like it will have to jump up in the queue. I have all of your books. Now, go write another one! Glad you enjoyed the excerpt, Kathy, and I hope you enjoy the book when you read it. Thank you all for commenting. I wish everyone could win! The book sounds really good. Thanks for the giveaway. I live in the US. Thanks for your good wishes Jen! I am glad to know that you have already read and enjoyed Brenda's book. Hi there Janis! I hope you enjoy this one when you read it. Thanks Daniela! Good luck in the giveaway. Is it very angsty? I like angst, but on the other hand I'm a bit of a wimp, it's a fine balance! I am so excited for this new book. I love Brenda's other novels and look forward to reading the new one. Congratulations and Happy New Year! Once I found out your book was on Amazon, I couldn't wait to get my e-book copy. I read it in one day during my holiday vacation. I just couldn't put it down. I love your plot. It was very different but you kept all the folks, Caroline, Charles, Jane, Fitzwilliam and Wickham true to character. Caroline and Wickham was evil as always. Mrs. Bennett was such a hateful woman. I am glad she got what she deserved. I love the way you portrayed Darcy and Elizabeth. It was beautiful love story. Even Georgiana had a HEA ending. I have read all your books that I could find on Amazon. I loved them all. I go back and read them over and over again. When can I expect the next one. So glad you enjoyed it Earlina. Another book by Brenda? Yippee! Having read her previous books and loved them,I must admit to really looking forward to delving into this one! It sounds so exciting! Like others have said,Brenda is the master of creating compelling adventures featuring a strong,determined Darcy and a feisty Elizabeth pitted against the latest evil genius Brenda has conjured up! Peppered with angst,they are a delight to read! Best of luck with your new book,Brenda,and thanks to you and Ceri for the giveaway. Hi there Mary! I hope you enjoy this one as much as you enjoyed Brenda's previous books. I enjoyed this story from the first time I read it years ago. I am over joy that this story was finally published. Thank you for sharing it with all the P&P readers. Another wonderful saga from Brenda Webb! Hooray! Poor Georgiana and Elizabeth to be caught in the web of George Wickham and this LeStang (does his name mean The Sting?. I am from Canada! Hi Carole, this sounds like another exciting read, doesn't it! Wow is all I can say. Elizabeth always thinks on her feet. Quick and calm. Glad you enjoyed the excerpt, Desiree! Wow! Can't wait to read this one! Finished A Promise Kept not long ago and loved it. Would love to win an autographed paperback! So glad you enjoyed A Promise Kept, Laura. Good luck with the giveaway. I enjoyed the book and would appreciate having a signed copy in my collection. I'm glad to hear you enjoyed it, Betty. Good luck with the giveaway. I just finished reading this for the second time - gave it a 5 star review...loved it. So glad you enjoyed reading the book Sheila. Reading something twice is high praise in itself when you have a TBR calling to you. Love Brenda's books. Looking forward to this one. Thank you for the opportunity. US entry. Thanks for commenting, Nicole, and good luck. I am so proud that all of you have taken time to comment. In fact, I am adding another signed book to the giveaway just because there are so many of you! Good look in the drawing! Goodness that was an exciting excerpt. Her plots are so creative and engaging and she writes good suspense and danger scenes. I'm still behind on reading some of her older published books. I can see why the forum fans wanted this one published. I agree, Sophia, very exciting! Thanks for commenting and good luck in the giveaway. Oh my goodness, what a tantalising and exciting excerpt! I've not read all of Brenda's books (yet!) but the ones I have read have been universally fantastic. This sounds to be no exception. Thanks so much for the giveaway Brenda. Good luck with the launch! I'm at angmardee (at) hotmail (dot) com and I'm INT. Love the excerpt!! Was it posted online before? I feel like I've read it somewhere... Beautiful cover too. Can't wait to read the book! Hi Priscilla. I'm glad you enjoyed the excerpt. I believe this one was posted online some time ago and people have been hoping that Brenda would publish it, so if I'm correct you may have read this before. Good luck in the giveaway! I've already bought and read this book. It's excellent, and I recommend not to miss it. The beginning is so sad, I thought I wouldn't be able to read further. But it's worth to continue, hope for D&L will grow. Apart from great romance, evil villains, adventure, kidnappings and other exciting events, there is more to this story. Brenda described hypocrisy of the Ton perfectly. To banish a pregnant, unmarried girl and force her to give up her baby, was the proper thing to do. But to keep both of them, protect and take care of them was shameful and scandalous. It was a unique take on this theme. It's a story full of angst, but don't worry. Brenda took care of ODC. I already own this book, so please don't count me for the giveaway. It sounds like a real rollercoaster doesn't it Becky! Thanks for commenting. On Tuesday (the 10th @10 pm) Taboo on FX premieres here in the states and in Britain on the 7th a news series about Regency England and all the corruption is being shown. The underbelly in London was not all romance and pristine manners! It has 8 episodes. Just posting this as it is so relevant to the world of JAFF and might surprise some readers. It was on here in the UK too, Sheila, but I missed it. I am so bad with TV! This one sounds amazing! I need to read it! I want it!! I want it!! I really hope I get lucky!!! Hi there. I hope you enjoy the story when you read it. Good luck in the giveaway. Love your comments! Thanks for taking the time and good luck! Glad you've been looking forward to it, Pat. Good luck in the giveaway! Hi there Dung! I agree, sounds exciting and angsty! Good luck in the giveaway. OMG, I love Austen re-imaginings! I'm actually working on one myself, and would love to read another! Almost forgot! I'm in the US, camtheinternut at aol dot com! Wow! What a thrilling excerpt! Can't wait to read more! Thanks for commenting. Good luck in the giveaway! Glad to hear it's a good read, Lynn! Hi Peggy. A signed copy is so special, isn't it! Good luck in the giveaway. Signed copy would be wonderful! I had to buy it though! Sounds completely intriguing! Thank you for another what if that I'm sure I will read over and over! Excellent giveaway. I just love paperback novels!!! Looking forward to this one, I've seen so many great reviews for it! Thanks for the chance to win a copy, so many giveaways I find don't include international. I'm in the UK and all my fingers and toes are crossed. Many thanks! I agree, it's so nice to have giveaways we can all enter. I am always very happy when there is an international giveway. Ebooks are such a bonus for that reason, because the postage overseas is so expensive! I’m really intrigued by the title! This looks interesting, and I like the design of the cover :) . I hadn't pondered on the title, but you're right Novella, very intriguing! Good luck with the giveaway. I'm so glad you published this one Brenda! I'd read it twice on the forum way back when, and am so happy you decided to publish this story! Even tough I've read the older versions I'm going to keep my fingers crossed for a giveaway chance. 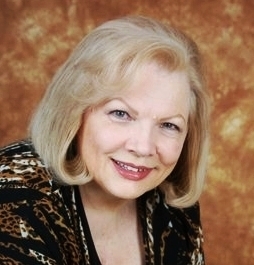 Congrats on publishing another book Brenda! Thanks for commenting, Colleen. Good luck in the giveaway. I always love finding new books and authors -- this one sounds great! I binge-read this quite speedily on the L&D boards - I couldn't put it down! I'm happy it's now published. Gorgeous cover, too.